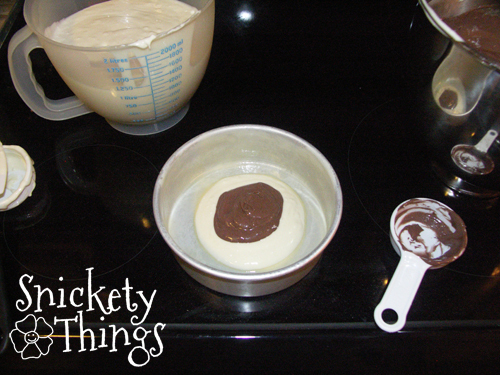 I promised I would show you how I made the zebra cake for Boo's birthday. Finally, I am able to take a few minutes to get it up. 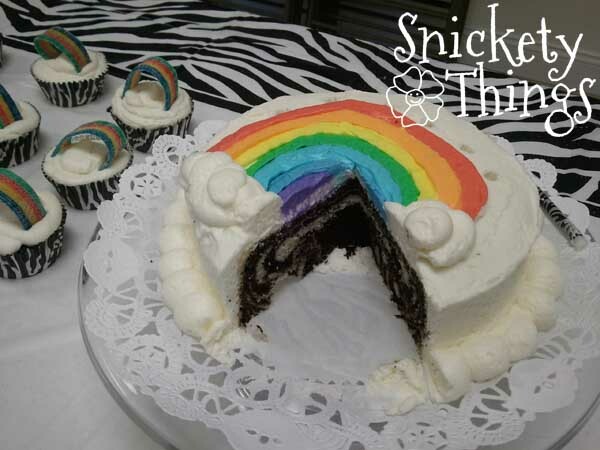 I found a picture of a zebra striped cake on Pinterest but it did not take me to instructions (make sure when you pin you have the proper source) so I did a search for how to make one and came up with several sites so you shouldn't have any trouble finding anything. I knew I was going to make cupcakes so I only needed a six inch cake to use for candles. 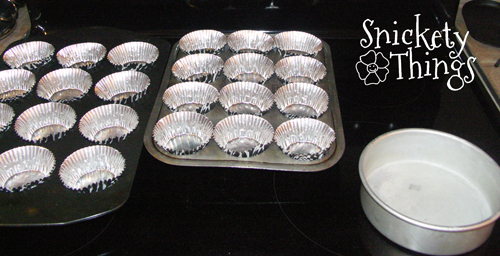 I chose to use the Wilton zebra cupcake liners that would retain color while baking. 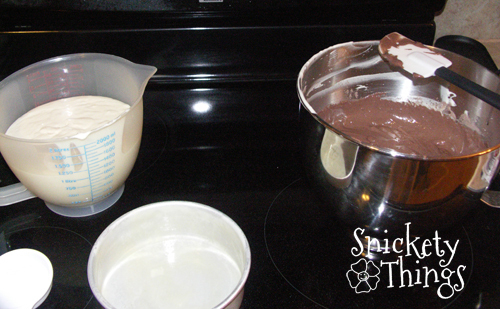 I made up two cake mixes (chocolate and french vanilla) to use. I departed here from one of the recipes I found online that suggested you add a bit to the chocolate cake mix, but I went on the fly. I shouldn't have. 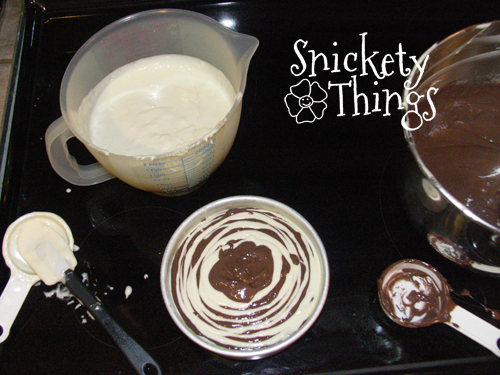 If you find one of the sites that says to add something to the chocolate, it will help thin it out a bit (I'm guessing). I just alternated a quarter cup of batter from each flavor until my pan was full enough to bake. The instructions said to bake according to package directions so I made sure I got two mixes that had the same bake times. Now, I'm not sure if my oven is having issues or if I did something wrong, but my cake took almost an hour to bake. That is way too long for a six inch cake to need and I didn't have a lot of time to start over so I just went with it. I had plenty of cupcakes so the cake wasn't really as much of an issue. 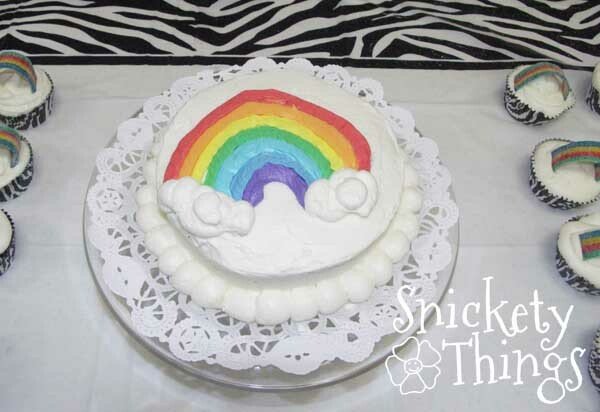 I iced the six inch cake white and used parchment sheets cut straight across to draw a rainbow on top. 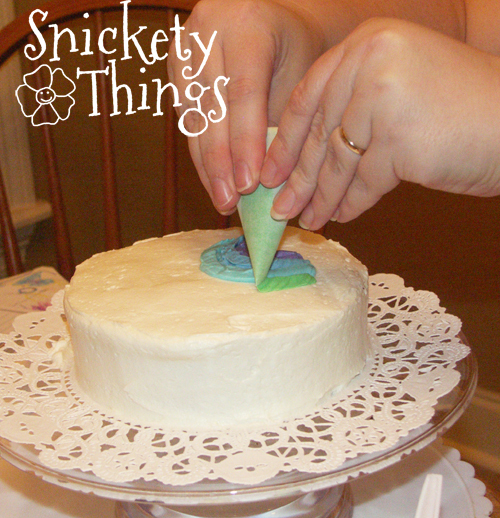 This is the first shot of me actually putting decoration on the cake. The hubs asked if he could do anything to help so I told him to grab the camera. 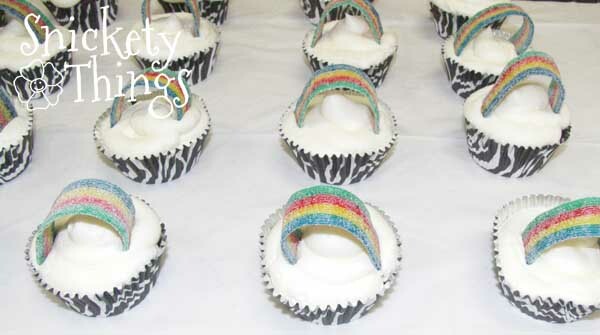 I also iced the cupcakes white and used candy to stand up for the rainbow on them. Just to remind you, this is how they looked. If you use this candy on cupcakes, put it on right before the party. The strips will slowly flatten down, they are not very stiff. Notice how the rainbow was off centered a bit? I didn't even let it bother me this time. I just keep telling myself about all the money I saved making this myself. And here is how it looked cut. What cakes have you made lately? OMG, this is beautiful! love your idea! Thank you! Good luck with the fondant!